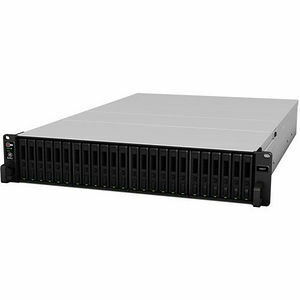 Synology FlashStation FS2017 is a high performance 24-bay rackmount NAS designed for 2.5" SSDs. FS2017 brings easy to manage, lightning-fast storage, perfect for video post-productions, mail servers, virtualization environments, and database applications. With the multi-LAN design, FS2017 is capable of performing Link Aggregation and failover. For environments requiring a higher speed, an optional Ethernet add-on card can be installed into the PCIe slot, providing fast data transmission of 40GbE/25GbE/10GbE. Synology FS2017 is backed with Synology's 5-year limited warranty. With technical support and hardware replacement service, the 5-year warranty maximizes your enterprises' return on investment. For the entire duration, you will enjoy technical support via email and telephone.